"European security 100 years after WWI"
Peter Ricketts has had a career of 40 years as a member of the Diplomatic Service. His final post was Ambassador in Paris (2012-16). Previously he was the UK’s first National Security Adviser (2010-12), and in that role was the coordinator of the 2010 National Security Strategy and Strategic Defence and Security Review. He was Permanent Under Secretary at the Foreign and Commonwealth Office(FCO) and Head of the Diplomatic Service (2006-10). His earlier roles included spells as the FCO Political Director (2001-3) and the UK Permanent Representative to NATO (2003-6). A particular strand to his career has been crisis management and politico-military affairs; he was involved in policy on the UK interventions in the Balkans, Iraq, Afghanistan and Libya. He holds Honorary Degrees from the Universities of London, Kent and Bath and is an Honorary Fellow of Pembroke College Oxford. 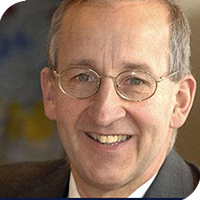 Lord Ricketts is a strategic adviser to Lockheed Martin UK, a Visiting Professor at King's College London, and Senior Associate Fellow at RUSI.